WinPatrol monitors and exposes adware, keyloggers, spyware, worms, cookies, and other malicious software. 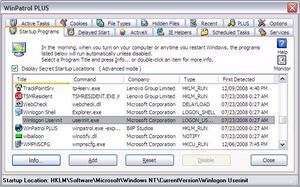 this software download puts you back in control of your PC with no need for constant updates. WinPatrol's goal is to help you understand what programs are running on your computer and to alert you to any new programs added without your permission. Unlike traditional security programs, it doesn't scan your hard drive searching for previously identified threats. Version 35.5.2017.8 is a freeware program which does not have restrictions and it's free so it doesn't cost anything. For security reasons, you should also check out the WinPatrol download at LO4D.com which includes virus and malware tests. Additional screenshots of this application download may be available, too. WinPatrol download been highly rated by our users.